Additionally, when you disclose an idea to the public, you risk waiving related trade secret as well as patent rights. Trade secrets are only enforceable when you have taken steps to ensure they are—and will remain—secret. Although an inventor has up to one year from a public disclosure to file a patent application in the U.S., it is strongly advised that an inventor first take precautions to protect all IP, or risk losing all IP rights. In the new US first-to-file system, it is even more important to be savvy about disclosure – or you risk that another inventor could file a patent application before you. One of the most important ways to protect IP is to avoid inadvertent or unplanned public disclosure. If the invention is released into the public domain — whether by publication, presentation, posting on a website, blogging, discussion with potential customers or suppliers — before a patent application has been filed, a total loss of the right to obtain a patent can result. Additionally, such inadvertent disclosure of the invention can reduce or eliminate competitive advantage. There are some very basic documents you should always have in place to protect ownership and confidentiality of your intellectual property. The major ones are invention assignment agreements, NDAs, and employee handbooks. Invention Assignment Agreements – An invention assignment agreement needs to state that all ownership rights in anything the employees develop are automatically assigned to the company. Language like “hereby assign(s)” should be included in the assignment. This helps avoid any ownership discrepancies. Non-Disclosure Agreements – Non-disclosure agreements (NDAs) may be used to maintain confidentiality and protect rights if disclosure to third parties is necessary for good business reasons. NDAs should be utilized when entrepreneurs present their inventions or business plans to potential investors, vendors, or advisors in an effort to secure financing or commercialize their product. Never divulge sensitive information until the NDA is signed. Employee Handbooks – Employee handbooks are great for laying out the expectations of employment, particularly the expectation that the company’s IP is not to be shared, disseminated, or stolen under any circumstances. As the US has switched over to the “first-to-invent” regime, emerging technology companies should consider patent strategies early in the design phase rather than waiting for a development of a prototype. This allows a company to establish earlier priority dates over subsequent patent filings by competitors and to establish a competitive advantage. Emerging technology companies should also consider specific commercial applications for the product or process for which patent protection is being sought. More often than not, a company tends to just focus on protecting its product (i.e., the device, apparatus or system) or the process, thinking that the competitor will need to get a license from the company in order to use the product or process. However, if the competitor pursues patent protection for the commercial uses of the product or process, the competitor can potentially block the company from specific commercial applications of the company’s patented product or process. This would then force the company to seek a license from the competitor for those commercial applications, and can minimize any leverage the company has over the competitor, especially if the competitor is seeking a license for the underlying product or process from the company. The same strategy can be employed if the emerging technology company is entering into an industry where there are established competitors. To the extent that the emerging technology company can identify white space, especially those directed to commercial applications of the competitor’s product or process, the emerging technology company can pursue protection of the commercial applications and force the competitor into a cross licensing scenario. With the enactment of the Leahy-Smith America Invents Act (“AIA”) in 2011, there are now multiple opportunities to speed up the patenting process for which companies, such as those focusing on emerging technology related inventions, can take advantage. Prioritized Examination – Part of the AIA is the creation of a Prioritized Examination (PE) process which allows applicants to request accelerated examination in exchange for payment of an additional fee. The goal is for qualified U.S. patent applications to reach final disposition within 12 months. Needless to say, this procedure provides inventors and business entities with an inexpensive alternative to the regular patent prosecution route, which on average can take up to about 3 years or more before reaching final disposition. 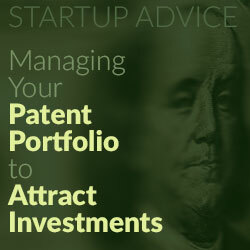 As such, for those companies in industries where products may have a relatively short shelf life, which can be particularly true for certain areas of emerging technology, who trade patent rights for investment or licensing opportunities, and/or regard patent rights as an important defensive tool against infringers, the incentives are high in utilizing this procedure to significantly expedite patent prosecution. Accelerated Examination – Similar to the PE program, a patent application filed under the AE program can expedite the patenting process in order to allow the application to reach final disposition within 12 months. However, whereas the PE program prioritizes an application for prosecution ahead of other applications filed under the standard procedure, the AE program prioritizes and accelerates the actual prosecution process of the application.One of the major differences between the PE and AE programs is the AE program requires an upfront pre-examination search, analysis of the search results, and explanation of the differences between the applicant’s invention and those identified in the search result to be filed with the application. This upfront requirement often performed by the applicant’s attorney can be time consuming and expensive, and on average can be as much as or more than the costs of preparing the application itself. However, while the AE program may involve significant upfront costs, it does not necessarily mean the total cost of prosecution under the AE program will be more expensive than the total cost of the PE program over the lifetime of an application. Moreover, the time spent in searching for related art and in improving/focusing the claims can yield stronger claim sets, which can contribute to faster allowance, possibly within months of being accepted into the AE program. Without such thorough analysis, an applicant in the PE program may end up spending much time and effort going back and forth with the examiner to achieve allowance. Filing a provisional patent application can alternatively be a useful strategy for start-up companies. A provisional patent application allows a company to preserve an earlier filing date at a minimal expense and delays a much more significant expenditure associated with a non-provisional application by one year. A provisional application is especially useful if it provides a detailed description of the invention and preferably explains valuable alternative implementations. Electing among the various types of examination (prioritized, accelerated, regular, and provisional) is best decided on a case-by-case basis dependent on the circumstance. This is because one size does not fit all even with respect to related patent applications. A first question that should be considered is whether the applicant wants to speed-up the examination at all. For instance, the applicant may wish to delay costs of examination until the potential market for the inventive subject matter further develops, at which time the potential value of the invention may be better known. Moreover, any delay in issuance of the patent due caused by the backlog in the USPTO can result in an extended patent term for the issued patent. Thus, depending on the present state of the art and the present demand for the invention, there can be circumstances when the better path to take is to forego speeding up examination. If speeding up examination of the patent process is desired, this does not restrict the inventor/applicant from pursuing multiple patent filing and examination options. Patents are the strongest form of intellectual property protection and are essential to the growth of an emerging technology company. As companies develop their products and processes, and begin to seek commercial applications for their inventions, managing and securing valid and defensible patent protection will be vital to their long-term survival. Emerging tech companies need to remain vigilant when transitioning from R&D to commercialization, since disclosing their technology without adequate IP protection in place can jeopardize their ability to secure future patent protection. And, with the availability of multiple filing and examination strategies, there is a full spectrum of options for managing as well as speedier examination of patent applications. Each option brings distinct risks and benefits and risks; therefore, emerging tech companies should carefully consider each option in the context of their overall IP strategy.